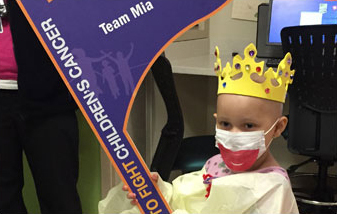 Seven-year-old Mia Bryant was the Honorary Race Starter for Run to Fight Children’s Cancer on March 7, 2015. Diagnosed with a brain tumor when she was six years old, Mia has relearned the ability to walk and talk. She is now 10 years old and a 4th grader! She loves to swim, write in her journal, and watch movies. Read all about Mia here.